The White House officially transmitted the nomination of Brett Kavanaugh to the Supreme Court on Tuesday, just in time for the judge’s first go-around of visits to the Capitol. Senate Republican leaders set up strict contours for press coverage, including mandating pool coverage of Kavanaugh’s grip-and-grin photo opportunity with Senate Majority Leader Mitch McConnell. The pool was escorted into McConnell’s office at 11:09 a.m. and warned no one would be taking any questions. 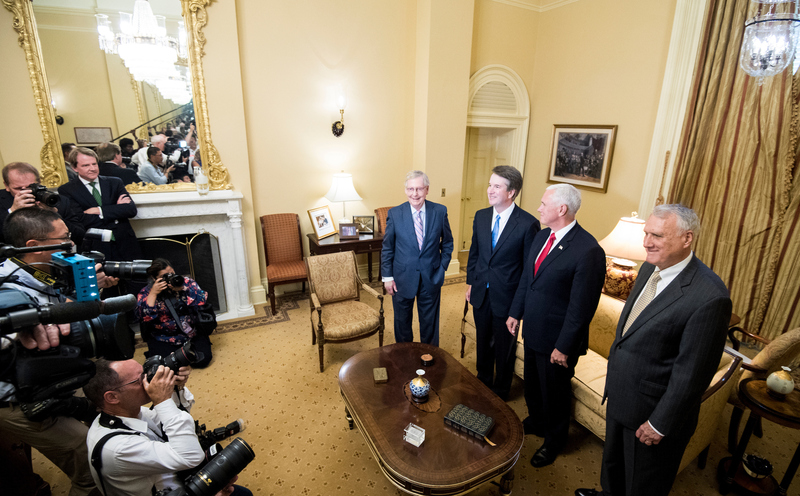 A minute later Kavanaugh, Vice President Mike Pence and former Arizona GOP Sen. Jon Kyl, Kavanaugh’s designated guide, or sherpa, for the confirmation process, came in and shook hands and posed for stills. Reporters asked if any Democrats will support Kavanaugh and how the vetting process was going, questions which were ignored. McConnell and Pence did make some remarks. “I think the president made an outstanding nomination and we look forward to the confirmation process to unfold in the next few weeks,” McConnell said. “Let me first say thank you to the Senate majority leader for his outstanding leadership over the last year and a half of this administration. President Trump has confirmed more judges to the circuit courts of this country than any president,” Pence said. “We’ll keep working and reaching out to members of the Senate in both political parties,” Pence added. The pool was then ushered out of McConnell’s office at 11:13 a.m.